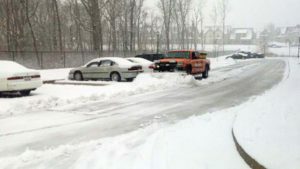 Is your business looking for Snow Removal from a company that is reliable, dependable, and has the equipment and knowledge to get the snow off quickly and efficiently? Grizzly Bear Lawn Care meets the mark for that. We have a fleet of snow removal and ice melting equipment to service your property. No job is too big or small. Also for businesses looking to service their own property, Grizzly Bear Lawn Care is a SnowEx Dealer for Columbia and the surrounding areas.